McDougal stands on a track in the Chitwan National Park in Nepal . 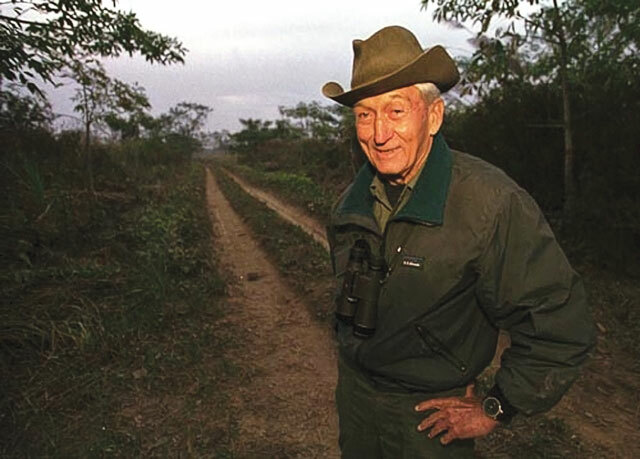 Charles (‘Chuck’) McDougal was a leading tiger ecologist, conservationist, researcher and writer, who pioneered responsible wildlife tourism standards in Nepal and the region. Chuck first came to the subcontinent as an anthropologist studying the Juang tribal people in Odisha, and then undertook the definitive study on the Kulung Rai in Nepal. Inspired by the jungle life of Jim Corbett’s books, Chuck switched his attention to tigers in the 1960s, initially to hunting then soon to research and conservation. He was a dedicated and self-effacing man with a gentle and modest manner, widely respected for his uncompromising approach to tiger conservation, and exacting standards for wildlife tourism. 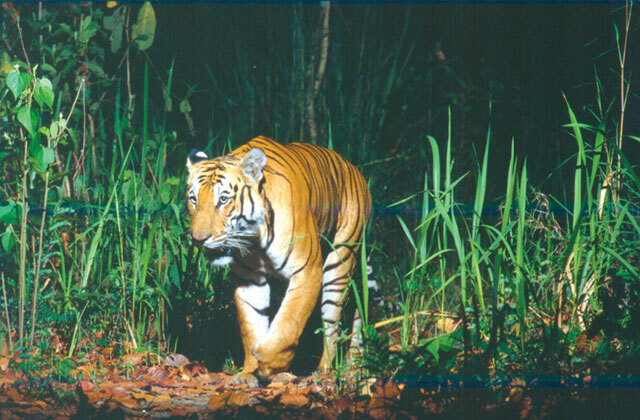 As Director of Wildlife of Tiger Tops Jungle Lodge, Chuck’s base for tiger research after 1972 was the Chitwan National Park, working with the Department of National Parks and Wildlife Conservation, the Smithsonian Institution and teams of Nepali trackers and naturalists. His painstaking research yielded in one of the largest and longest-running data sets of any tiger population in the world. It uncovered the secret world of tigers and what they need to survive in their forest habitat, providing today’s wildlife managers with the vital information required to protect these iconic animals. Crucial to the data collection was Chuck’s innovative development of camera-trapping through a homemade pressure plate in the 1970s. Over the years he photographed hundreds of different tigers and also an impressive inventory of other creatures including sloth bears, leopards, jungle cats and the rare honey badger. TIGER SELFIE: The famous tiger selfie that Chuck Mcdougal took in 1980 with his innovative pressure plate camera capture technique. Chuck’s authoritative book, Face of the Tiger in 1977, was the result of thousands of hours of observation and tracking. He published many scientific papers himself and with colleagues, notably Professor J L David Smith of the University of Minnesota with whom a major work on the tiger is being published by Harvard University Press. He recently completed a collection of jungle tales that will be published posthumously. In Nepal, Chuck teamed up with English-born A V Jim Edwards to found Nepal Wildlife Adventures, an early hunting company in the Tarai. But they soon realised it was time to abandon hunting and embrace conservation ideals. In February 1972, Jim and Chuck took over the management of Tiger Tops Jungle Lodge from the two Texan millionaires and big game hunters. Together their brand of purist wildlife expertise combined with commercial realities to set global standards for the adventure tourism industry. Chuck avoided the limelight and based himself in Chitwan to study tigers. With a strong emphasis on nature interpretation, Tiger Tops wildlife lodges and tented camps extended throughout India as well as Nepal, with activities in Sri Lanka, Bhutan, Tibet and beyond. Tiger Tops formula of responsible wildlife tourism and conservation synergy was an acknowledged model long before ecotourism became a buzzword. In later years, Chuck developed a pessimistic ambivalence towards the more rampant impacts of tourism, advocating that benefits only accrue when tourism is more carefully controlled and channelled as a positive force for conservation. Many wildlife operations in Nepal and the region today are still managed and staffed by Chuck McDougal-trained specialists, who regard the quiet American as their guru and inspiration. Chuck retired from Tiger Tops in 2001, and devoted himself to travel, research and writing, continuing his tiger monitoring program in the Tarai through the International Trust for Nature Conservation of which he remained an active trustee. Charles McDougal died on 11 May in Kathmandu and is survived by his wife Margie, and children Robert, Juan Carlos, Malcolm and Linda. Emerging from fog in Birganj. There is salvation for consumer goods manufacturers. Giving up meat has health benefits, and may even make us less violent. The peace process must go on a war-footing.